While Jesus was teaching in the Temple, he called out, "Yes, you know me, and you know where I come from. But I'm not here on my own. The one who sent me is true, and you don't know him. 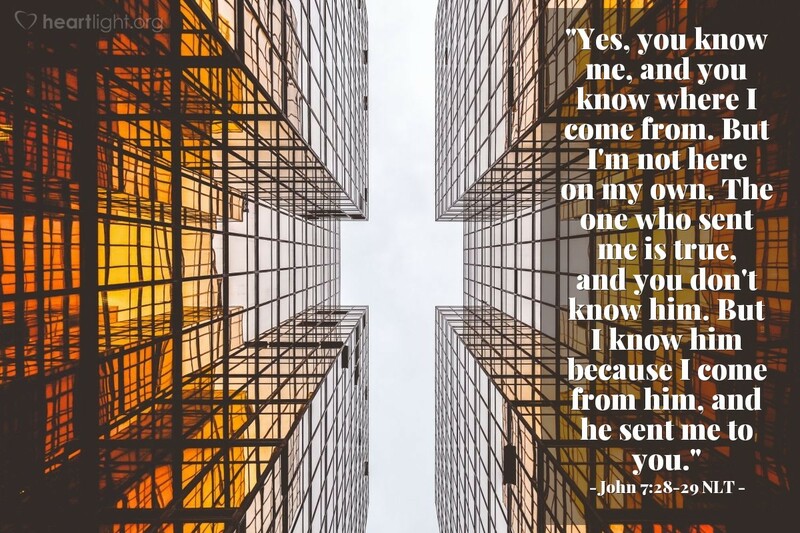 But I know him because I come from him, and he sent me to you." Jesus came on a mission. It wasn't a mission of his own initiative. He wasn't looking for honor for himself. He was sent to do the Father's work, to do the Father's mission, and to bring glory to the Father by completing his work. The cost was high: He gave his life to complete the Father's work. The mission was clear: It was to reveal the Father to us. The amazing thing, however, is that when Jesus ascended, he gave us a very similar mission: "As the Father has sent me, so I am sending you!" (John 20:21). So let's live each day following the example of our Savior, fully committed to represent the one who sent us and to reveal his glory and grace. Holy God and loving Father, I confess that sometimes I see life as monotonous and predictable. I lose sight of the opportunities to do your work with each new day. Sharpen my focus, God, so that I can seize the opportunities each day to help others see you more clearly. Give me passion as I face the challenges, opportunities, and yes, even the monotony of each day. Empower me to live as one sent on a mission. In Jesus' name, I pray. Amen.